Festo, inventor of sophisticated and elegant robotic birds, as well as robot jellyfish and penguins, has done it again. The company's latest robotic achievement is a dragonfly, the BionicOpter, which can independently move each of its wings to fly in any direction. Introduced at the Hannover Trade Fair in Germany this week, the BionicOpter is one of many projects the company has pursued under the aegis of its Bionic Learning Network. The network's purpose is to use the energy-efficient principles already found in nature and adapt them to automation technology. 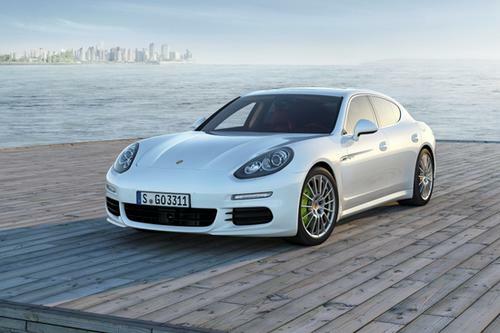 Porsche’s first-ever plug-in hybrid, the Panamera S E-Hybrid, will store energy in a 9.4 kWh lithium-ion battery. The vehicle’s hybrid predecessor (not a plug-in) employed a 1.7 kWh nickel-metal hydride battery pack. Because the S E-Hybrid won’t be officially announced until the Auto China Show in Shanghai later this month, details on it are still scarce. Porsche said, however, that the vehicle will combine a 95 HP electric motor with a 3.0 liter V6 engine. In true parallel hybrid fashion, it will employ a power split enabling it to combine power from both sources under certain conditions. When the driver starts the vehicle, it will automatically operate in all-electric mode. A button on the console will prevent the gas engine from contributing power unless it’s needed. Top speed of the vehicle is 84 mph during all-electric operation. Drivers can boost the power by pushing the accelerator beyond a detent halfway through the pedal’s travel, enabling activation of the gasoline engine. “The detent makes it easier for the driver to learn and discern when the powertrain is going to flip on the gasoline engine,” Twork told us. Top speed with both sources contributing is 167 mph. The $99,000 Panamera S E-Hybrid will offer significantly more pick-up than two of the industry’s most prominent plug-ins, the Chevy Volt and Prius PHV. In tests conducted by Edmunds.com, the Volt went from 0 to 60 in 9.0 seconds, while the Prius came in at 10.1 seconds. A more reliable car isn't necessarily engineered better. That's the takeaway from a recent Consumer Reports survey, which once again placed Toyota and Honda at the top of the heap. Volkswagen AG is planning to roll out a production car that will combine a plug-in hybrid powertrain with low weight and an aerodynamic shape to reportedly achieve a startling fuel efficiency rating of 261 mpg. The worldwide auto industry is taking the wrong path to environmental friendliness, Fisker Automotive co-founder Henrik Fisker told an audience at the recent Chicago Auto Show. After a long drought, an American-made compact car, the Chevy Cruze, will finally offer a diesel engine later this year.